South Koreans have adopted the practices of their Japanese neighbors when it comes to celebrating the day of love. Females are the expected gift givers during February 14. Then on White Day, it is the turn of the males to reciprocate. But it seems that the South Koreans have (unintentionally perhaps) one-upped the Japanese by having a special holiday on the 14th day of each month for couples in romantic relationships. The only exception is the special holiday celebrated every 14th of April (more on this later). These South Korean special holidays (not to be confused with public holidays, though) may seem corny for many but they are fun nonetheless. The first month of the year brings about a certain "newness" to any romantic relationship. January 14 is designated as Diary Day in South Korea. Diaries or 12-month planners are exchanged between couples (and close friends). These are used to take note of important dates such as birthdays, anniversaries, special events and other plans. Couples are encouraged to recount times spent with each other. It's a good way to keep track of things in the relationship lest one partner wants to be the accepting end of the ire of the other. Western Valentine's Day practices are all too common in South Korea. 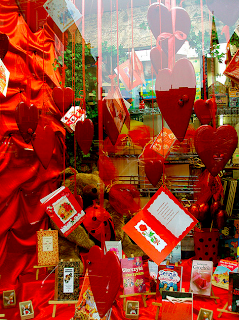 There are decorations of hearts, roses and cupids in red, pink and white hues. Chocolate and candy sales are up. The only difference is that women are expected to give men gifts instead of the other way around. There is a sense of obligation to this practice. Some report that women give less expensive chocolates to men whom they are mere acquaintances with or whom they are not exactly fond of. But for men they really like, they choose the more expensive chocolates. Apparently, on this day, the chocolates do the talking. This practice was more common in the workplace when it started but has since gone beyond office buildings. South Koreans adopted this Japanese special holiday, which is an answer to Valentine's Day. This gave South Korean men the chance to respond to their female counterparts. The common gifts given by men on this day are supposed to be predominantly white in color. Roses and other flowers are expected to be white and so are the stuffed animals or plush toys. White chocolate roses, marshmallows and other white confections are some of the gifts given out by men to certain women. Jewelry and dolls are also popular gifts during White Day. Of course gift giving during this day is, like on Valentine's Day, out of love, friendship, obligation or mere courtesy. The 14th of April is jajangmyeon-eating day for those who did not receive anything during Valentine's Day or White Day. This special holiday is known as Black Day in South Korea. Loveless men and women are given this day to drown their sorrows in "jajangmyeon," which is black colored noodles mixed with black bean paste. Single people who wish to celebrate (or commiserate) Black Day drink black coffee and consume other black colored foods. Dressing in black from head to toe is a common practice. The 14th of May is dubbed Rose Day and also Yellow Day. Those in a romantic relationship exchange rose bouquets to signify their love for each other. Some couples choose to wear clothes in shades of yellow during this day. So that single people are not left out, they have their own tradition on this day. And that is to eat curry. The language of the lips is celebrated during June 14. It's Kiss Day in South Korea. Locking lips is the order of the day for all couples. A number of venues and Seoul-based businesses try their best to capitalize on Kiss Day by organizing events like kissing contests and coming out with promotions to commemorate the day. Jewelry stores profit from this day as couples are expected to exchange silver rings and other types of silver jewelry or accessories on Silver Day. The silver rings may sometimes serve as a couple's promise to marry each other at a future date. Some couples choose July 14 as the perfect day to introduce their partners to their parents or tell their friends about their on-going romantic relationship. South Korean couples take time to visit Mother Nature on Green Day. They go hiking, take a leisurely walk in a park or engage in other activities close to Mother Nature's heart. Couples often dress in green on August 14. For those who do not have a significant other, August 14 is also of some importance to them. This is the day when partner-less single men and women drown their sorrows at being loveless by drinking "soju," a drink that comes in a green bottle. The taste of "soju" is similar to vodka but slightly sweeter. An entire day is dedicated for couple to take pictures of each other and to have pictures taken of them together. After spending the day clicking away, September 14 ends with enjoying a night of singing or listening to music at one of the many karaoke rooms ("noraebang") around town. To confirm their romantic bond, some couples exchange music CDs on this day. It's not exactly a day for couples to get inebriated. Rather, it is a day to enjoy a good glass or two of wine with one's significant other. The air is cold in October making wine a great companion to a good meal during a couple's romantic date. Single people also indulge in wine for their own personal reasons. In the end, it is really the wine sellers that are happiest on October 14 because of the volume of wine they are able to sell. Couples are encouraged to go out and see a movie together on this day. But since there are no rules to this celebration, catching a flick at home is probably acceptable, too. Hugs are often more powerful than words and transcend language barriers. In South Korea, Hug Day encourages couples to lock themselves in a tight, meaningful embrace. It's a great way to keep each other warm and toasty during this cold winter's day. But, it is not a special confined to lovers only. Hugs can also be exchanged between family and friends. Some people go around to give hugs to complete strangers (at no cost). If you look at the list of special holidays above, you may find yourself scratching your head and asking yourself "WHY?!" Some of these special holidays seem silly and do not make sense at all. However, South Koreans are not the only people that have celebrations and holidays that do not make sense to other races and cultures. Some holidays were born thousands of years ago and were based on time-honored traditions. Others, especially recent ones, may have been born out of self-serving reasons (mainly for increased profit for certain companies). Other holidays just sounded like good ideas at the time they were conceptualized. Whatever the reasons are for celebrating a particular holiday (regular, religious, special, etc. ), respect it, honor it or simply enjoy what it is supposed to commemorate or stand for. When you are in South Korea or any other country for that matter, remember that it is more fun to join in their unique brand of fun than spending the time making sense of what is going on. Maybe as you learn more about the culture, its people and their language, you will be able to get what all the hoopla is all about.